Add a 'NEW TILT' to an existing Display Case. Our Car Stands assemble in seconds and are Adjustable, so you can choose the angle and fit that works best for you. 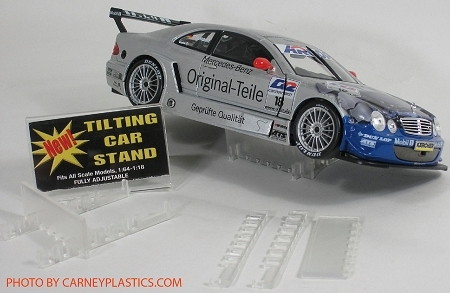 They also work great for lifting your SLOT CARS up off of their tires to eliminate flat spots! Display your Cars in a brand new way, or change the look of an existing case. Carney Plastics, Trusted Quality Since 1986.